Just shook hand with RIMOWA CEO Dieter Morszeck ! Love this German typical designed suitcase. Aluminum, rational and high quality made in German signature. Always impressed by German fastener and mechanism. They represent reliability, dedication and long lasting. And today the CEO just come to visit our studio. Jay introduced me to the CEO, executive director and sales manager. And we shaked hands! They are offering the high-end aluminum suitcase for Embraer executive jets. The CEO Mr. Morszeck is so cool, he is also the pilot who flew Junkers F13, which is the first jets made by metal. 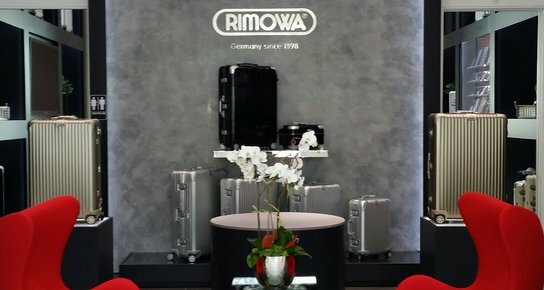 And he found this suitcase brand RIMOWA with groove aluminum inspired by the jets. Right now they also use polycarbonate. Here is their store in Miami. Hope I can visit their store when I travel in NYC this winter. Check their website! The interaction is like a display where model pose and stop. And it won the Red Dot Award 2014. They are so nice and gentle even though they are so success. Never stop pursuing your dream, and be nice no matter what change.